I didn’t want to go to the ‘Wonderland’ in the Museum Gardens – the ‘main event’ of Illuminating York 2012 – but have quizzed someone who did go, last night. Before he went he’d read the comments on the Press story, which were mainly (totally?) negative. So he didn’t go with the expectations those who went on the first night maybe had. He thought that it wasn’t as bad as those comments suggested, and that the different parts of the display throughout the gardens were interesting or entertaining enough, and ‘worth a fiver’. That the Vic Reeves part projected on the museum building wasn’t enhanced by the commentary about the images. That the younger people who were part of their party had enjoyed the dancing in front of the abbey. I was curious about the part previously inaccessible, behind the art gallery, which I’d heard was open as part of this event. He hadn’t seen that. Whether it was because it wasn’t actually open, or because he’d missed it, I’m not sure. He also observed that there wasn’t much going on other than that, that there wasn’t a sense of anything happening on the streets around. There are things happening, at the Minster, Treasurer’s House, NRM, etc, all holding ‘illuminated’ happenings of some kind. There may be more venues with events this evening and tomorrow (Saturday). But many are some distance apart. 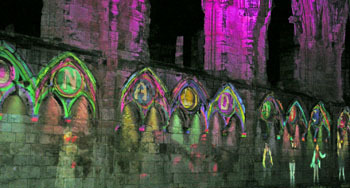 Last year the place was buzzing during Illuminating York, and one of the best aspects was that there was an open ‘central event’ – open to all, free, at the Eye of York (near Clifford’s Tower). A massive crowd stood together to watch a display on the front of the Castle Museum. In Dean’s Park near the Minster another large crowd gathered around lights and sound, again, just people freely wandering in. This year the main event requires payment, and is ‘gated’, enclosed within the Museum Gardens. Other events are being held in other buildings. There’s nothing, it seems, for people to gather around as a community. Visitors will make the effort to come, residents who might have wandered into the city to join in and have a look seem less likely to as the festival seems to have no clear centre, apart from a paid-for attraction which has, it has to be said, been slated by many people as a disappointment, or even a ‘rip off’. As far as Wonderland goes, think I’ll stick with remembering the ‘Big Night Out’ Vic Reeves offered twenty years or so ago, via the bizarre and memorable TV programme of that name. More on the supporting programme in yesterday’s posting. Or select the tag IY2012 below for other pages on this year’s festival. I went to the Museum Gardens on the first night (Wednesday) and – for the most part – thought it was very enjoyable. The ambient lighting used throughout the gardens to accentuate the architecture and plant life was subtle and tasteful. The AV display on the Hospitium was very excellent and the interactive dance display was visually arresting and fun. I too missed the bit behind the art gallery. The thing that let the display down was the centrepiece: the projection of a selection of Vic Reeves’ drawings animated onto the front of the Yorkshire Museum. While it looked and sounded great, with vivid colours and quirky imagery, it was utterly ruined by his own narration. Possibly the low point of his commentary, which was essentially Vic’s explanation of his own artwork, was when he railed – with no apparent hint of self-awareness – against the curators of art museums for attempting to explain art, rather than leaving it to the interpretation of the viewer. I only wish he’d taken his own advice. The semi-coherent and hypocritical ramblings emanating from Reeves’ disembodied giant head were a cringe-worthy distraction from his (really very likeable) artwork. The event was not helped by the heavy rain that made some parts of the site very muddy which, as some areas were – necessarily – dark, made getting around quite tricky. There were also many people using antisocially large umbrellas which obscured their own view of much of the lighting, blocked the narrow and crowded pathways and threatened to poke anyone over six foot tall in the eye. That’s not really the fault of the organisers though. Anyone who doubts it was a Wonderland though should really have experienced it, as I did, with a small child. My nineteen-month old wandered around slack-jawed and utterly transfixed. His under-five ticket was also free. I have to say that as an experience, £5 for the two of us to be entertained for an hour probably represents quite good value for money. The problem, however, lies in the comparison with last year’s animation onto the Castle Museum which was both utterly spectacular and free. Pretty much anything attempting to follow that will feel like an anticlimax. I read Mark’s comments before going (we had already booked with some friends a few weeks ago), so wearing wellies and warm clothing was prepared for the worst (weather). I concur with what Marc said about VR talking about his art, the left had projection could have been made better use of – but the variety of music the commentary produced was enjoyable. For a £5 each the whole thing was reasonable value (although the extra £4 to see the limited lights at the Minster wasn’t). The fact that it was sold out on Friday, apart from the 9:30 showing must mean something, and it was reasonably easy to get around without any massed hoard hogging a viewpoint. Conclusion? It was different. Bringing psychedelia to York at Samhain is a worthy concept. Listening to ‘Night on a Bare Mountain’ recalled the spirits rising in Disney’s Fantasia. Whilst less magical and more amusing for adults, children must have enjoyed it?